We will focus on close textual analysis of drama, supplemented by biographical, historical, cultural, economic, and critical information related to the works and their authors introduced by the teacher and students. The class will consist of several parts: the lecture by the teacher, student presentations, and informal group discussion. The combination of lecture, presentations, and discussion is a format that should prepare teens for the college environment. At each class, we will watch movie episodes and documentaries related to our discussion. In addition, we will have several movie nights where some of the best play adaptations and films will be screened, as well as other movies that emphasize the time period studied in the class. We will take a field trip to a Chicago theater that produced Chekhov’s plays and will hold a discussion with those involved in the production. In the spring, we will present a showcase of scene studies from some of the plays. Our major playwright will be Anton Chekhov (whose dramatic works were written from 1881 through 1904), but we will start with Nikolai Gogol’s satirical comedy The General Inspector (1842) and will end with Mikhail Bulgakov’s brilliant farce Zoyka’s Apartment (1926). The Inspector General is the funniest Russian comedy. Gogol rejects traditional devices such as the love interest, the conventional happy ending, the character that is the author’s mouthpiece, and the commedia dell’arte type of role development. Instead, he creates more complex, living characters that combine both typical and individual traits and refuses to divide them into good and bad. Most of them are rogues but all display a mixture of qualities. This comedy, both in its characterization and in its language, is much nearer to real life than any previous Russian play. We will discover how Gogol reduces the disharmony, which seems to him the very essence of reality, to comic grotesque through laughter. In this, Gogol anticipated the Western European theater of the absurd of Ionesco and Beckett. Of Anton Chekhov, Leo Tolstoy had said that “to evoke a mood, you want a lyric poem. Dramatic forms serve, and ought to serve, quite different aims. In a dramatic form the author ought to deal with some problem that has yet to be solved…. But you won’t find anything of the kind in Chekhov.” In this criticism, Tolstoy hit on exactly those features that have made Chekhov’s plays the fundamental works of modern drama. Like lyric poems, they favor mood over plot; and when problems do appear, Chekhov never seems to endorse any solutions. The class aims to look at the interaction of Chekhov’s background, his experience of life, and his ideas with the poetics of his plays – their themes, imagery, construction, and philosophy – and thus show the evolution of the playwright. 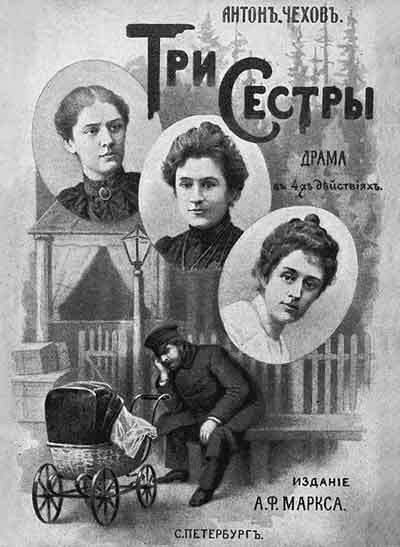 Chekhov’s first successes, one-act farces such as The Bear, The Proposal, The Celebration, The Wedding, and his monologue The Evils of Tobacco, show him to be a master of comic timing. Reading these farces alongside the later plays changes how we see Chekhov and will encourage the students to respond to the comic elements in Chekhov’s major plays. Chekhov’s best plays – Ivanov, The Seagull, Uncle Vanya, Three Sisters, and The Cherry Orchard – changed the theater forever. We will examine Chekhov’s major plays from the humanistic point of view: his deep understanding of human psychology; of our place in relation to a social and economic context; of the passage of time; of life, death, and nature. We will explore the greatest controversy attached to Chekhov’s plays: whether the plays are tragic, gloomy, and melancholy, or whether they could be called comedies, enabling Chekhov’s tone to remain non-judgmental, detached, and reserved. The teacher will introduce the participants to the letters and notebooks of Anton Chekhov that provide a context for his literary, social, and scientific interests and views, and establish a coherent intellectual and emotional portrait of the writer. Bulgakov called his play Zoyka’s Apartment a “tragic farce.” We will explore its connection to Gogol, Chekhov, and modern drama of the time. Everything in the play has a touch of illusion. Under an apparently futile and frequently comic surface, a genuine human tragedy is revealed. Bulgakov’s Zoyka’s Apartment will illuminate the students’ perception of the mordancy and nuttiness of life in Moscow in the 1920s. The teacher will use her Russian background to provide participants with a unique chance to appreciate some of the pleasures of the original Russian versions of the works of Russian playwrights that are inevitably lost in any translation. We will look at the various ways to translate Gogol’s comically significant proper names and will try to come up with our own translations of the characters’ names. We will read two excellent new translations of Chekhov’s major plays by Laurence Senelick and Marina Brodskaya and will compare them against the Russian version. Such an approach will make it possible for participants to understand the reasons why Chekhov is an unusually difficult playwright to translate. We will discuss the translators’ attempts to put Chekhov’s Russian into modern American idiom and whether the effort to make Chekhov sound more American may lead the translators to word choices that a sensitive ear may find anachronistic. What sounds better: “literacy programs” or “reading rooms”; “homeless man” or “tramp”; “freak” or “crank”? In addition to the Russian playwrights, we will read and discuss as a class one play by a major 19th to early 20th century European playwright chosen by the class. Finally, each student individually will read one play by one of the following European playwrights: Leo Tolstoy, Henrik Ibsen, August Strindberg, Gerhart Hauptmann, Oscar Wilde, Maxim Gorky, Maurice Maeterlinck, or George Bernard Shaw. The students will make presentations and will write their final research papers after discussing their research with the European Drama consultant. Amount of Outside Work: Considerable reading and writing/presentations load. The required reading is up to 150 pages bi-weekly. Age/Maturity Level: 14+ (mainly because of the textual/visual content). I will consider having mature 13-year-olds in the class. We are going to read adult, college-level plays and watch movies that may demand extreme emotional involvement on the part of the reader/viewer. Course Requirements: The course workload consists of careful reading of the works mentioned above; the reading of additional texts from various fields (literary works, criticism, history, and philosophy); watching the films; making class presentations; and writing assignments for each class. Three analytical papers are expected from the student (each 3 to 5 pages long in the MLA format). The final fourth research paper will be on a topic of the student’s choice (up to 8 to 10 pages). As the class is discussion-based, students are expected to take an active part in all discussions. Estimated Cost: $10 per class, which will cover the cost of the binders, copying, and the unique handouts provided for the students. You will want to buy some of the required editions that could be difficult to find through your local library. Location: The class will be taught at Julia Denne’s home. Please contact Julia at jkdenne@aol.com for details. Time: Classes are scheduled for 2 hours every other week. The suggested time is 1:30 to 3:30 p.m. on Wednesday afternoons. Movie Nights will be on Saturday nights. The class will start in October and will end in May. The Bear pp. 3 – 18; The Celebration pp.113 – 126. The Evils of Tobacco (to be provided by the teacher); Ivanov pp. 19 – 83. November 10 – An Unfinished Piece for a Player Piano. Directed by Nikita Mikhalkov. Starring Alexander Kalyagin and Elena Solovey (103 min), 1977. The movie is based on Chekhov’s unfinished play (Platonov) and a couple of his stories. It gives a good idea of the Chekhov mood and his world. December 15 – The Seagull. Directed by John Desmond. Starring Frank Langella and Blythe Danner (120 min), 1975. January 12 – Chekhovian Motifs. Directed by Kira Muratova (120 min), 2002. The movie is based on Chekhov’s play Tatiana Repina and short story Difficult People. Kira Muratova is one of the best Russian film-makers. February 23 – Vanya on 42nd Street. Directed by Louis Malle. Starring Wallace Shawn, George Gaynes, Julianne Moore, and Andre Gregory (119 min), 1994. This is one of the best movie adaptations of a Chekhov play. Please try not to miss this movie. March 9 – August. Directed by Anthony Hopkins. Starring Anthony Hopkins (94 min), 1996. Another successful adaptation of Uncle Vanya. April 20 – The Cherry Orchard. Directed by Michael Cacoyannis. Starring Charlotte Rampling and Alana Bates (137 min), 1999.